I've been watching a colony of House Sparrows (Passer domesticus) for much of the summer that laid claim to a weeping Higan cherry in my landscape just out my front door. I use the word "colony" rather than "flock" because I recently learned that house sparrows breed in colonies; they are very social birds which is something I never knew. And, they have great entertainment value. I've never paid much attention to house sparrows before; after all, they are non-native invasives. There are numerous websites dedicated to putting the kibosh on these bad-birds as well as those vulgar European Starlings (Sturnus vulgaris). Obviously, the house sparrow colony in my weeping cherry didn't know this. They continued to squawk and frolic; keeping our cherry clean of Japanese beetles (Popillia japonica) and scooping up stranded Masked-Chafers (Cyclocephala spp.) left in the mornings around our porch light. All the while remaining aloof to the plotting and planning posted online that's dedicated to their doom. Their merriment was shattered a few days ago when I looked out my front window to see what I believe was a juvenile Sharp-Shinned Hawk (Accipiter striatus) perched on top of the weeping cherry. I can't be certain of the ID; it may have been an immature Cooper's Hawk (A. cooperii). As I said, I'm not a birder. 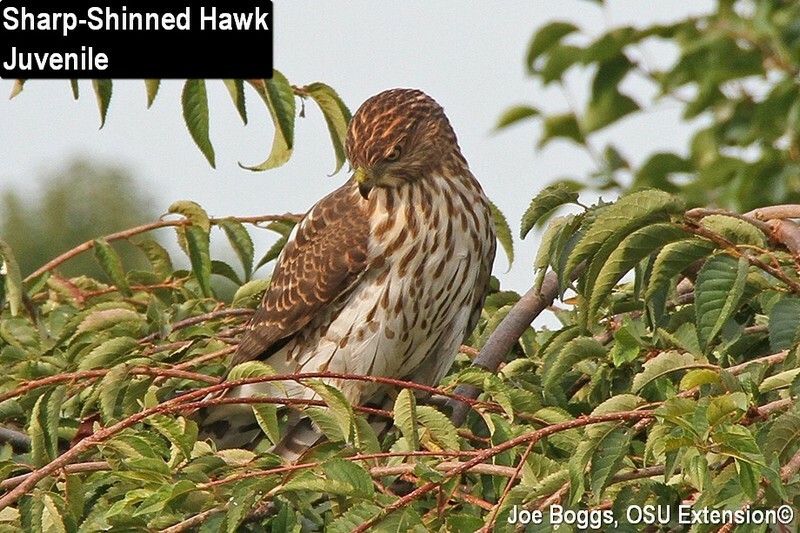 However, I'm not alone in having trouble identifying these so-called accipiter bird-eating hawks. According to the National Audubon Society's, A Beginner’s Guide to IDing Cooper’s and Sharp-Shinned Hawks: "Lots of birders—expert birders—have come away shaking their heads and jotting down “Cooper’s/Sharp-shinned” in their notebooks. This is a tough one." I'm fascinated with hawks and other raptors and accipiters are particularly special. These hawks have rudder-like tails and short, rounded wings that allow them to dart in and around trees; their preferred hunting grounds. And, they eat birds … no doubt because they taste like chicken! Regardless of whether it was a sharp-shinned or Cooper's hawk in my cherry, it certainly acted like a juvenile. Rather than using its considerable inborn aerial acrobatics skills to swoop down upon an unsuspecting house sparrow, the hawk landed on top of the weeping cherry and tried nabbing its feathered table fare by descending among the tangled branches. The much smaller house sparrows easily out maneuvered the much larger bird. Worse, judging by their loud squawking, I'm pretty certain they were taunting the poor hawk. No raptor should suffer such embarrassment … and being caught on camera. Despite the proven cover provided by my Japanese Higan weeping cherry, the house sparrow colony has not yet returned. My wife has heard them in a nearby Callery pear and I've seen them in a small European beech in the neighborhood; but the cherry now seems off-limits. Perhaps their ill-advised behavior with shunning the protective weeping cherry branches is the basis for "birdbrain."